Sadly, another loss has occurred in the Beagles on the Web family. Spenser was, in the memorable words of his devoted owner, Laurie Kramer: "fearless, brilliant, and too tall". A debonair kinda guy with a penchant for Special Walks with his Daddy, Phillip. And an intrepid explorer who, in his younger days, was taken to exploring the wooded area outside his yard... and would sometimes return with battle scars. He now joins his canine brother Scooter, who has no doubt welcomed him at the pearly gates with a wag and a lick. 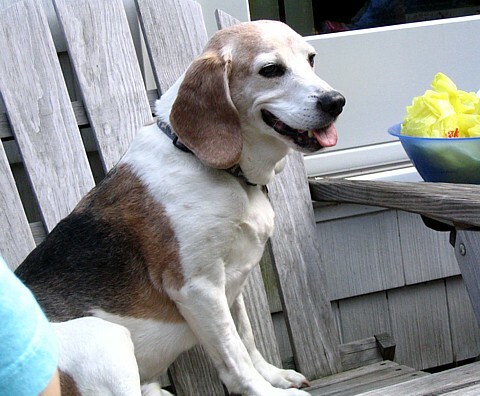 I'll remember Spenser fondly as an affectionate Beagle boy who was the consummate host at Beaglefests; one who would hop up on your chair, insisting his 40-something lbs. still qualified him as a lap dog. My heart goes out to the Kramer family. Please join me in celebrating his life and watch the DD this week for more remembrances of Spenser.